“Girlfriend, boyfriend, business man, artist, thinker, nature lover, party person… everyone #wearsEA. Do you?” Emporio Armani dropped this campaign on social media a few days ago, promoting that any type of person can find a piece to take away from the brand that will aptly express their individuality. Saturday’s runway show, titled with the same ‘#wearsEA’, elaborated on the story. 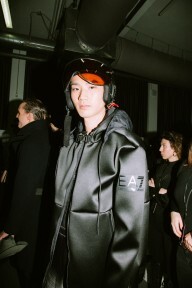 Hence it showed a great range of characters, from the snowboarders in ski suits who opened the show, to the business men in neatly tailored suits. Several men walked with their arm over the presumedly aforementioned girlfriends, who mainly wore little black dresses. Giorgio Armani also seemed to have turned his back on one of his most influential signatures: his languid tailoring. Carrot pants appeared, but now somewhat shrunken, and jacket sleeves barely grazed the wrists. There was a slight madness to the sheer volume of personalities being presented, with little to find that united them through the collection beside a penchant for wearing only black and navy. 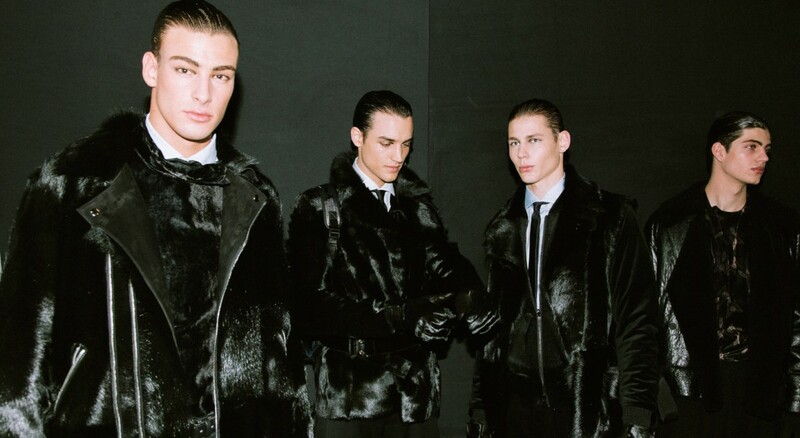 The moody palette seemed to be the organising factor, deepened and enriched through fabrics like velvet, fur and jacquard. And worn head-to-toe or as a trim on a brogue, these opulent fabrics gave a hint of whimsy and irreverence to the gang, that moved them oh so slightly away from traditional ideas of masculinity.